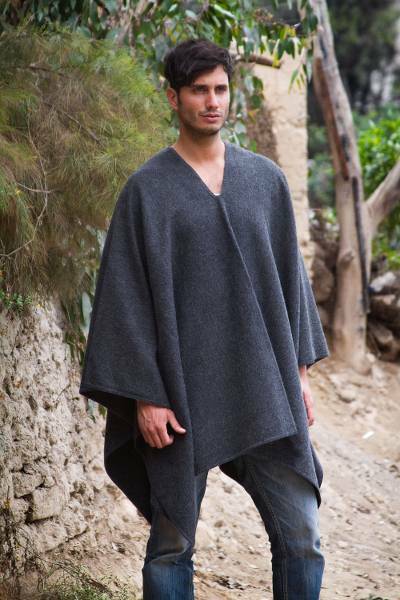 In the tradition of the Andes, Celinda Jaco designs a handsome poncho for men. The warm v-neck poncho is woven of a soft alpaca blend and finished by hand. Once reserved for the Inca aristocracy and later for special occasions, alpaca is coveted for its warmth. You can find men's alpaca blend poncho 'Inca Explorer in Gray' by Celinda Jaco in clothing categories such as Acrylic Ponchos, Acrylic Blend Ponchos, Alpaca Wool Blend Ponchos, Alpaca Ponchos and Alpaca Wool Ponchos. Enjoy exploring these sections for other Novica treasures. I bought this for my boyfriend for Christmas (early Christmas present) and he loves it. He says it's very comfortable and warm and had the biggest smile on his face. Thank you so much, Celinda!